Visiting Walt Disney World is a blast! The parks are fantastic, offering continually changing fun. However, after a few days of walking from one attraction to the next, your legs begin to beg for mercy! One way to spend some great time together is by visiting Disney’s Fort Wilderness Camp Grounds and attending the Chip ‘n’ Dale Sing-Along. This great FREE event can be found right in the middle of Disney’s Fort Wilderness Resort (click for map, listing # 7). The fun begins around 7 p.m. during the fall/winter season and 8 p.m. from April through the summer (To check exact times, call Fort Wilderness direct at (407) 824-2900). 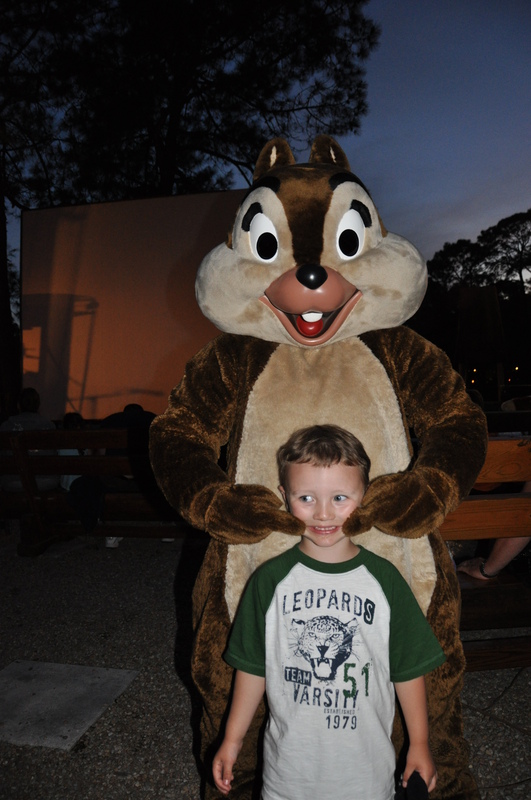 The sign-along includes a variety of performances by cast members who are joined by Chip ‘n’ Dale who come around to meet and greet all of the guests and sign autographs. The sing-along lasts approximately 40 minutes. During this time, guests are invited to use the small bonfire pits to roast marshmallows for making s’mores. Should you not have your own supplies with you, you can purchase items from the Chuckwagon Snack Bar. Some of the offerings are roasting sticks – $0.49 each, Marshmallow Bag -$3.99, Hershey’s Chocolate Bars – $1.99 each, or a whole s’mores kit is around $8.99. In addition, you can also purchase pizza, hot dogs, candy, nachos, juice, popcorn, sodas, coffee, beer and other refreshments. To get to the resort, take a bus from your resort to the nearest Disney theme park, water park, or Downtown Disney. Then catch the bus there to the Fort Wilderness Resort and Campground. You can also take a boat from the Disney’s Magic Kingdom theme park.